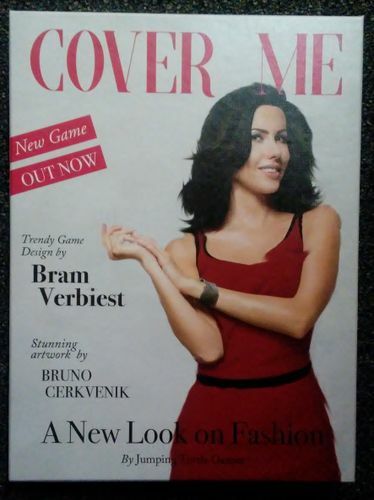 Cover Me is a game by Bram Verbiest, published by Jumping Turtle Games. It is for 2-5 players. In this game, players take on the role of chief editor of a trendy fashion magazine. They will be trying to influence the upcoming fashion trends by placing the trendiest models from their portfolio onto the cover of their magazine. This will earn the magazine prestige which will help them beat out their competition. In the end, the chief editor that is able to raise the most prestige for their magazine will be declared the winner. To begin, the Catwalk is placed in the center of the play area along with the Mirror board. The 3 fashion markers for the background patterns are placed on the 0 space of the Catwalk. The 6 fashion markers for the clothes colors are placed near the Catwalk. The 3 fashion markers for the hair length are placed on the 0 space on the first mirror of the Mirror board. The 3 fashion markers for hair color are placed on 0 space of the second mirror of the Mirror board. The year marker is placed on year one of the Mirror board and the season marker is placed on the winter snowflake space of the Mirror board. Players choose a Magazine and take the 2 corresponding cards, placing one in front of themself and the other in a column beneath the Catwalk. Space should be left to the right of this column for rows of 3 cards, as well as above these columns and beneath the Mirror board for the influence row. This row will never have cards more than the number of players. All of the Model cards with red, yellow or blue clothes are shuffled together to form a stack which is placed face down beneath the columns. Cards are drawn from the stack sorting them by hair color until there is at least one of each type placed in a row. If a card matches a color that has already been revealed, then the card is placed on top of the previous card. This keeps going until there are 3 stacks of different hair colors. The green clothes Model cards are shuffled together and placed face down in a stack near the row of Model cards. The black clothes Model cards are shuffled together and placed in a face down stack above the Mirror board. The same thing is done with the white clothes Model cards, shuffling them and placing the stack face down beside the black clothes Model cards. The starting player is chosen and is given the starting player marker. Two cards are drawn from the draw pile and placed into the influence row. The fashion tracks are adjusted based on the Models in this row. Each player is dealt 6 cards each. Beginning with the first player each player will then take either a card from the open draw piles or the face down stack. This continues until each player has 9 cards in their hand. It should be noted that if one of the three draw piles is emptied, then a new card is drawn from the stack and sorted based on hair color until there are 3 draw piles again. This method is the same as mentioned above. Once this is taken care of, play now begins. The game is played over 3 years. Each year is divided into 4 seasons; winter, spring, summer and fall. Each season is divided into 4 steps or phases. In the first step, players will play Model card from their hand. For each season, 3 months or rounds are played. Each month players will place a Model card face down in the middle of the table next to their magazine card. Once each player has done this, the cards are flipped over and the fashion tracks are adjusted by moving the fashion markers. Each season there are three active fashion traits; hair color, hair length and background pattern or clothes color, which are dependent on the season. It should be noted that during the fall and winter the background pattern is used, while during the spring and summer the color of the clothes is used. Each active trait on the Model card will move the fashion marker that corresponds with that trait one space forward on the track. It should also be noted that the Model cards in the influence row will also count towards tracking each trend and will move the trackers forward as well. The dominant characteristic will become the trend. Once 3 cards have been played for each player and the trackers moved, play moves to the next step. The second step or phase is to select the most trendy model for each magazine. In this step the players determine the trend value for each of their cover models on the table. The trend value is equal to the number of characteristics that match the season's overall trends on the fashion tracks. This value can range from 0-3. Each player will determine which of their models is the most trendy. That model will be the one with the highest trend value. That model will be placed in the season special and they remain on the table. The remaining Model cards are returned to the player's hand. It should be noted that if a player has two models with the same highest trend value, then the player will choose which one will be returned to their hand and which one will stay. If a player has all 3 models with a trend value of 0, then all 3 remain on the table. Once this is completed, play moves to the next step. The third step or phase is to evaluate the season special and replenish the player's hand. To start this step, all the cards in the influence row are discarded. Players then check their model(s) still on the table. If their model has a trend value of 3, the card is placed face down beneath their player card and they will score prestige. If their model has a trend value of 1 or 2, the card is placed in the influence row. If their models all have a trend value of 0, then all of them are placed beneath their player card scoring them prestige. Once this has been done, each player will then take turns taking a new card beginning with the starting player until they have 9 cards in their hand again. If the player scored prestige, they are able to take a card from either the open draw piles or the face down stack. If all 3 of their card scored, then they may take all 3 cards one after another. If the player didn't score prestige, they will take the top 2 cards from the next draw pile, which is beside the open draw piles, and keep 1 card and place the other on the bottom of the next draw pile. Lastly, the season on the season track is adjusted and the starting player marker is passed to the next player in turn order. The fashion tracks are reset back to 0, before adjusting them based on the cover models in the influence row. Play starts back over with the first step, unless the fall season has just completed. In this case, a new year begins. Starting a new year is the fourth step or phase and only happens after playing through the winter, spring, summer and fall seasons. First off, the year marker is moved to the next year. The next draw pile beside the open draw pile is placed face down on top of the draw stack. The 3 open draw piles are placed into the discard pile. Cards from the new face down draw pile are revealed to form 3 new open draw piles based on hair color. The deck with the next clothes color is moved from above the Mirror board to beside the open draw piles to become the new next draw pile. Starting with the starting player each player in turn order is able to place one of their cards into the discard pile and choose a card from one of the open draw piles or from the face down draw stack. If one of the open draw piles is emptied, then cards are revealed until there are 3 open draw piles again. Play then starts over with the first step or phase. The game continues until after the fall season of the third year has been played. At this time, the game ends and scoring occurs. Players take all of the cards that they scored beneath their player card and place them face up in front of themself. Each colored card has a specific value. Yellow, red and blue each score 3 points. Green scores 3. Black scores 4 and white score 5. Each player will count up the point values of all their cards. The player with the most prestige points is the winner. This game is very thematic and beautiful. Let's start off with the biggest piece, the Catwalk. This is a really large custom cardboard piece that has to be assembled before playing. Once it's completed, it really brings out the theme of the game. The artwork on it is really great and looks like the back stage of a fashion show with designers and hair and makeup personnel running about in a frenzy. This could have been a simple board or track to keep up with the trends, but the designer went the extra mile and really made this something that stands out. On top of that, when flipped over and placed inside the game box, it doubles as a organizer. There are places to keep the cards and other pieces from moving around. It's really quite cool. Next there is the Mirror board. This is pretty thick cardboard with some great looking artwork on it too. It too is quite thematic with the look of 2 models looking in a mirror while the track is made up of the light bulbs and makeup around the mirror. Granted, it's the same model picture only flipped to the other side, it's still very cool looking and fits in well with the theme. There are several tokens and markers that are included with this game as well. There are hair length markers, hair color markers, a calendar marker and a season marker. These are all thick cardboard. The calendar and season markers are a little larger than the others. The hair length markers show the 3 different lengths of hair on a woman. The hair color has yellow(blonde), orange (red/brown) and black for the different hair colors of the models. I like these pretty well, especially the hair length markers. However I think maybe some wooden pieces like a cloud for the season and maybe just some colored cubes would have worked just as well. It may have even upped the overall look. As it is, these are still cool though. The next things are the background pattern markers, the fashion markers for the clothes colors and the starting player marker. These are little double sided cardboard standees. Mostly they are all just silhouettes with either a colored dress or a different background behind them. I like these and they look pretty good overall. I think that the acrylic pieces that were part of the Kickstarter look a little better than these cardboard pieces though. I sort of wish that there had been some wooden themed meeples, but I understand that this would probably have upped the price of the game too much. Still, these markers look thematic and bring the game to life. The final components of this game are the cards. There are 10 player cards for the player's magazine, 2 of 5 different designs. Each one represents a different fictional magazine. I like these and how different each one is. Of course the best part of the game is the Model cards. There are a whole bunch of these. These have designs of different women and each card is simply amazing. The artwork on them is great. I like how it seems that the artist took a picture and painted each one. The designs really bring the game to life and are the absolute highlight of it. The iconography on these cards is very simple and doesn't take long to learn. Needless to say, I've seen a lot of great looking games over the past year, but this has to be one of the best of 2017. I'm amazed at the detail and love that was put into the look and theme of this game. It's jaw dropping amazing. This game came with 2 rulebooks included, one in English and one in German. These are very well designed. There are plenty of great looking pictures and examples throughout the books. There are 3 pages of pictures that include the details of each card, a listing of components and a detailed setup. The book isn't that long and is very easy to read through and understand. There are even tips for playing the game included. The last page of the book contains rule adjustments for playing with only 2 players. The back cover contains several variants for longer games, shorter games and for having all cards have the same value. There's even an advanced variant for 2 players included which gives a bigger challenge and lowers the luck factor of the game. About the only thing missing is a reference guide on the back cover. Even without that, the book looks really great as a whole. I feel that it is well designed and I'm pretty much happy with the whole thing. Upon first looking at this one, I thought of the game Pret-a-Porter. That's probably due to the theme of the game which is fashion. I'm sure that there are plenty of guys out there that are probably thinking, "why would I want to play a game about fashion?". The answer is because it's fun. While you are dealing with fashion in a way, the game is actually more about manipulating the system to make the cards you play become worth more points. In this way, it feels a bit more like an economic game. Each time you play a card, you're having to think about what the current trend is and how that you can adjust those tracks with the cards in your hand so that you can score the most points. Of course if you're trying to score all 3 cards by matching none of the trends, that's the most difficult thing to do. I will say that I like that this rule is included, but so far I have yet been able to accomplish the task. There is a bit of luck involved, especially if you're playing a 2 player game without the advanced rules variant. That said, there is still a fairly good bit of strategy involved too. As I said, making the right decisions on which models to play is the key. I really like that the game is so thematic, even the components are smothered in theme. There is one thing that I didn't mention in the components section about the cards that I'd like to bring up. That is that the models are very diverse. It's not like they only chose skinny girls or girls of a particular race. There is every race and size there. The models are not objectified and are not wearing clothing that is too revealing or anything of that nature. I really feel that because of this, players are able to play the game without getting into an uncomfortable discussion about ethics or morals. One thing that I really love about this game is that, as a father of a young daughter, I can play this game with her and feel comfortable with it. This allows her to see that there are women of all shapes, sizes and races and that you don't have to be a particular one to be beautiful. Ok, I realize I'm getting off the subject a bit, but I felt that I needed to say that. Anyway as for the game, I really feel that this is a great game that can be adjusted to your own game play styles. If it feels a bit too long, there are ways to shorten it. If you're wanting more, than you can make it longer. My daughter and I really enjoy this one. I think that fans of games like Pret-a-Porter or Rococo should enjoy the fashion aspect of this game. I also think that this is a good family game, especially for those of us with daughters. Even male players can enjoy the game if they like a game with an economic feel to it. Overall, I enjoy it. This is one that I would recommend. It might not be for everyone, but I really think you should give it a try anyway. You might find that you like it more than you thought you would. Cover Me is a thematic game about running a fashion magazine that is fairly simple to learn and play. The length of the game can be adjusted to fit your play needs. However most game sessions last around 45 minutes to an hour. The components are great. They are very thematic and look amazing. I especially like the cards with the diversity of models, as well as the beautiful designs. The Catwalk, while a bit overproduced, is quite cool and makes a great organizer for inside the game box. The Kickstarter version adds a bit more pizzazz to the game that the regular version is lacking. I would have liked some wooden meeples and pieces to make the game even more thematic. The game itself is quite enjoyable and has a bit of an economic feel while incorporating a fairly underused theme. With ways of shortening or lengthening the game as well as special rules for 2 player games, this should appeal to a wide variety of players. As a family game, it's very good especially for families with daughters. While the game does have a fair amount of luck, especially in the 2 player game, it can be fairly strategic as well. Some of that luck can be adjusted with the variant rules when playing with only 2. Fans of fashion games like Rococo and Pret-a-Porter should enjoy this one. Overall I enjoy this game immensely. While the theme may turn some gamers away, this is one that should definitely be tried. This is a game that I would definitely recommend. No tickets to Paris or Milan are required. For more information about this and other great games, please check out Jumping Turtle Games at their site.